Monkey D. Luffy creeps me out. I’ve tried getting to know the main character of the popular manga and anime series many times, but his blank stare and creepy grin have put me right off One Piece every time. Now that’s I’ve had some time stretching, spinning, and leaping my way across Jail Island as the boy pirate in One Piece: World Seeker, I’m starting to warm to the little freak. This piece was first published on March 13, 2019. We’re bumping it today for the game’s release. 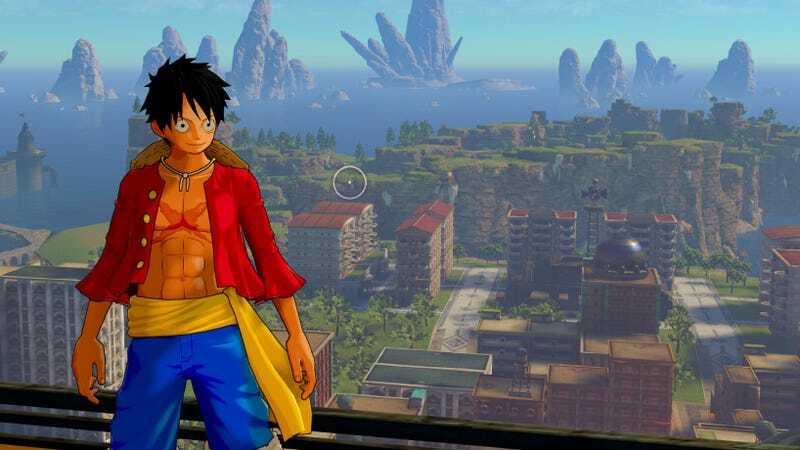 One PIece: World Seeker, due out March 15 on PC, PlayStation 4, and Xbox One, is a free-roaming action-adventure game. While attempting to heist a valuable treasure, Luffy and crew find themselves separated on Jail Island, a vast New World area overseen by the Marines. Captain Luffy sets off on a quest to find his crew, getting caught up in a plot between the military forces occupying the island and the locals, who’ve had enough of being bossed around. Luffy is the perfect protagonist to star in a large-scale open-world adventure. Utilizing the rubber powers he gained by eating a mystical Gum-Gum fruit as a young boy, the character zips up buildings using his stretchy arms, slingshots himself through the air, and hovers by spinning his legs like a propeller. The freedom of movement is a joy, bringing to mind Spider-Man for the PS4 or similar superhero fare. Though a fast-travel option exists to quickly zip from point to point across the sprawling island, I barely use it. I flip and fly and fling across the landscape. When the game’s vast set of unlockable skills allows me to modify my travel methods, allowing me to hover or throw myself farther, I’m glad to backtrack and do it all over again. Everybody loves a skill tree. I’d be perfectly fine playing One Piece: World Seeker as a traveler, just exploring the world, but there’s other stuff to do as well. There’s the main story, which sends Luffy into battle against pirates, Marines and other ne’er-do-wells. Combat is a simple combo-based affair. There’s one button for melee attacks with multiple unlockable skills and two different stances to modify those attacks. A stealthy player can avoid battle by hiding in barrels, or sneak up behind enemies for a quick takedown. Luffy can even pull off ranged attacks, headshotting foes from afar. There are main quests and sidequests. Luffy’s crew can help him craft costumes and accessories using items he finds scattered about the world or on the bodies of defeated foes. The game’s karma system lets Luffy form relationships with characters, unlocking their personal side missions. Japanese developer Ganbarion has put together one hell of a game, certainly the most ambitious ever created for the One Piece franchise. I’ve played Monkey D. Luffy in fighting games countless times, and I’ve never connected with the character nearly as much as I have just running through the green grassy hills of One Piece: World Seeker. Maybe it’s time to give the anime another try. Or I’ll just play this through to the end and leave it at that.